Our 10th Mixed Styles Evaluation! 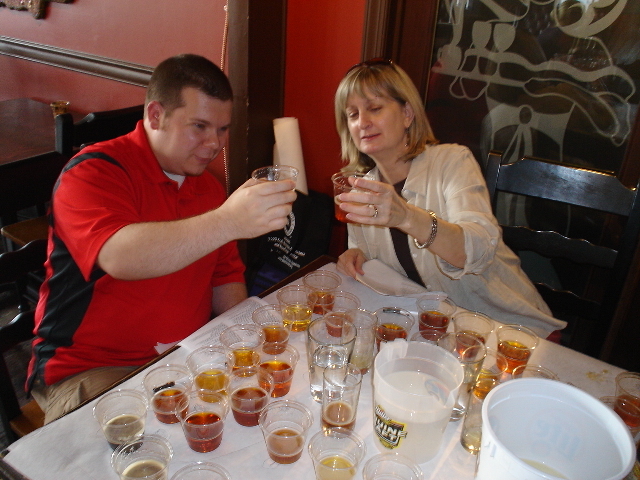 L-R: Nick Allen and Gail Graves compare colors of two pale ales. 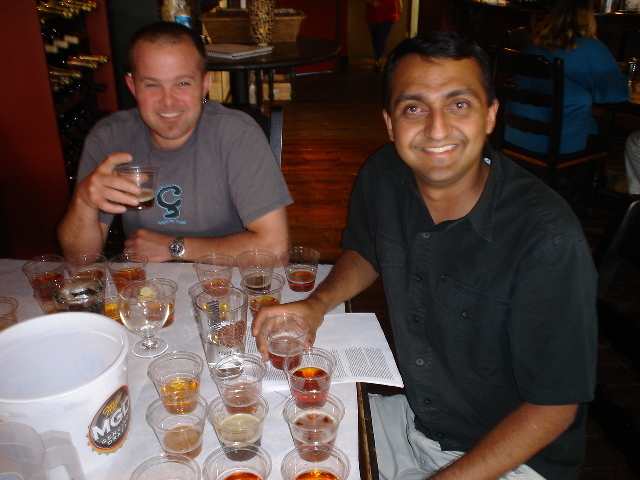 Eric Johnson (left) is co-owner of Trappeze Pub in Athens, GA.
Sachin Patel (right) is owner of Athens' Five Points Bottle Shop and Aromas Wine & Beer bar. Owen Ogletree (director of Brewtopia Events LLC) gathered together fellow beer lovers Nick Allen, Dean Graves, Gail Graves, Eric Johnson and Sachin Patel on May 30, 2008 at Aromas in Athens, GA to sample and comment on several mixed styles of ales and lagers from commercial and craft breweries from around the world. This sampling was done as a "best of show" blind tasting where no one was aware of the brands that were being served. Products were informally commented upon and ranked according to Beer Judge Certification Program (BJCP) style guidelines. First, second, third places, and honorable mentions were awarded to the products we felt represented their individual styles in extraordinary fashion. Drop Owen an email to share your comments and opinions. Classic City Brew Fest - Athens, GA.
Aroma: Bubblegum, wheat, mild clove, mid banana. Appearance: Medium gold, mild haze, nice white layer of foam. Flavor: Fresh wheat yeast rolls, citrus hints, refreshing wheat flavors, round mouthfeel, a little bitter in the finish, hint of sweetness, quite malty. Great example of the style. Aroma: Mild hop aromas, a touch of malt, light caramel, nice citrus, very subtle and clean. Appearance: Copper, clear, white foam. Flavor: Refreshing, dry, clean, tasty, citrusy, pine resin tones, hops are well balanced with malt, pleasant lingering bitterness. A nice example of the style. A very pleasing session ale. Aroma: Piney, resiny, fresh hops, caramel malt. Appearance: Clear. Amber in color. Flavor: Piney, nice, malt, moderately dry up front with hint of sweetness in the finish, nice hop flavor, moderate hop bitterness, high end of malt and hops for style, borders on an IPA. Aroma: Wild honey, flowers, Saaz hops, mild citrus, orange peel hints, lots of noble hops. Appearance: Clear, light gold, brilliant. Flavor: Grainy, a touch hay-like, lingering bitterness, crisp, low hop flavor, very dry, malts are light and in the background. Big hop bitterness is impressive. Aroma: Sweet malt, honey, slightly fruity, a touch of butter. Appearance: Very clear, straw yellow with a light stand of white foam. Flavor: Light malt, slightly sweet, biscuity, mildly fruity, hops are earthy and very restrained, not bitter at all, honey notes, some diacetyl as it warms. Aroma: Honey, wheat hints, mild citrus notes, subtle aromas, herbal hints. Appearance: Golden, clear, white foam, light head. Flavor: Medium dry, very little aftertaste, sweet malt flavors are all up front, very little finish, silky start with vanilla and honey, flavors fade quickly, hops are mild. Aroma: Berries, fruit, melon. Lacks coriander and orange character. Some lactic notes. Appearance: Light haze, gold, nice lacy white foam, not very cloudy. Flavor: Berry, chamomile, honey, citrus, mild lactic hint, herbal notes, mildly sweet, too complex for style. Needs more clean coriander, wheat and orange peel character. Aroma: Fruity, malty, woody UK hops, cardboard hints, chemical note, butterscotch undertones. Could be a bit old. Muscat grape hint. Appearance: Dark gold/light amber, very clear, mild white head. Flavor: Woody, cardboard, lemon, pine, hint of butter, finish is nice - caramel malts and tannin/citrus flavors, nice hop profile. Aroma: Coffee, cocoa, toffee, fruit, candy, dark chocolate hints. Appearance: Dark red / light brown color. Tan head. Heavily carbonated - too much for style. Flavor: Malty, grassy, citrus, coffee notes, fruity, slightly acidic - could have a touch of infection. Lactic hints, tart, nutty. Hops toward finish - woody - nice, bitter hops at the end. Aroma: Artificial raspberry syrup notes, fruit extract, very perfumy and candy-like. Appearance: Hazy with a slight pink rose color. Light pink foam. Flavor: Wheat hints, raspberry undertones, dry, spritzer-like character, cereal notes, very mild flavors. A bit watery and thin. Aroma: Sweet malt, citrusy hops, pine notes, fig, candied fruit, raisin. Appearance: Amber color. Nice head. Off white foam with good head retention. Flavor: Biscuity, toasted malt, fruit hints, dry, pleasant, clean. Needs more hop aroma, flavor and bitterness. More malt and mouthfeel would also be good for style. Bitterness is good. Aroma: A bit syrupy with notes of dark fruit. Very low hops for style, very fruity with notes of cherry and other light fruits. Appearance: Amber with moderate carbonation. Very clear. Flavor: Berry, fruit, malt. Needs more hop flavor to be a great IPA. There is clean malt with caramel notes. This is a pleasant beer, but not quite an American IPA.